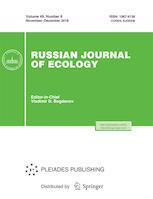 The Russian Journal of Ecology publishes completed original studies in all branches of theoretical and experimental ecology, reviews, articles on topics currently in debate, and information on new methods of research. Russian Journal of Ecology is a peer reviewed journal. We use a single blind peer review format. Our team of reviewers includes over 70 reviewers, both internal and external (85%). The average period from submission to first decision in 2017 was 30 days, and that from first decision to acceptance was 50 days. The rejection rate for submitted manuscripts in 2017 was 70%. The final decision on the acceptance of an article for publication is made by the Editor-in-Chief. Are Food and Habitat Resources Key Factors Determining Bird Species Richness at Broad Landscape-Scale in the Mainland of China?